The name of the range derivates from one of its peaks (Vf. Retezat), whose summit has a particular aspect as seen from distance: its top looks like having been cut off (cut-off = retezat in Romanian). There are a couple of legends "explaining" the reasons. One of them says that two giants fought, and one of them cut off the summit’s top. Another recalls three fairies, which agreed to build three fortresses. Two of them asked for God's help, the third one was very lofty and claimed she will do without the help of God. The other day the castles of the other fairies stood finished (Déva and Kolcz, today called Deva and Colţ), but the third one could not accomplish anything. In her anger, the third fairy threw her trowels towards the other fortresses to destroy them, but missed them - instead, the peak of Retezat was hit, and cut off. Retezat is probably the most prominent mountain area of the Southern Carpathians (also called sometimes "Transylvanian Alps"), covering almost 500 square km. Its average elevation is over 1500 m, with a quarter of its territory rising above 1800 m (and still rising in our days, by about 3.5 mm/year). The region, made up of mostly granite/grandiorite massifs, was formed by glaciers of the Pleistocene era. These glaciers streched over several kilometers (the longest one, in the Bucura Valley, could have surpassed 15 km). As a result of - in geological terms - recent glacial activity, Retezat is rich in beautiful tarns and waterfalls. Especially the abundant blue and turcoise tarns (situated mostly, but not exclusively, between 1900 m and 2200 m above sea level) give this place a special charm. There are 82 lakes in total, including Romania's largest (in terms of surface area) and deepest glacial lakes: Lacul Bucura /Bukura-tó/ and Lacul Zănoaga /Zenóga-tó/, respectively. The lowest and highest lakes of Retezat are Tăul dintre Brazi /Fenyők-közti-tó/ (1740 m) and Tău Porţii /Kapu-tó/ (2230 m). Tău Ţapului /Zergebak-tó/ is remarkable because of its small island. In wintertime, all lakes get ice and snow cover, blending totally with the surroundings. Retezat is a water divide between Mureş /Maros/ and Jiu /Zsil/ rivers' watersheds. Affluent creeks of the north side (Nucşoara /Nuksóra/, Râu Alb /Fehérvíz/, Râu Bărbat /Borbátvíz/ and others) join river Strei /Sztrígy/ directly, while those of the west and southwest (Lăpuşnicu Mare /Nagy-Lepusnyik/, Zlata, Râuşor /Malomvíz/ and others) first join Râu Mare /Sebesvíz/, which later enters river Strei. The southeast slopes of the southern main ridge - partly via Buta, Lazăru and Bilugu creeks (latter being the eastern border of Retezat) - drain to Jiu de Vest /Román-Zsil/, which is called Scocul in its upper region. The creeks of Retezat have several waterfalls, the two most notable ones being Cascada Ciomfu /Csumfu-vízesés/ in the very upper part of Râu Bărbat (more than 150 m in multiple cascades) and Cascada Lăpuşnicu Mare /Nagy-Lepusnyik-vízesés/ (about 20 m high, but with ample water flow). The range is characterized by its two parallel main ridges that are connected by a short ridge, forming an H-shape. The northern ridge is higher, on average, than its southern counterpart. The west end of the southern main ridge (Piule-Iorgovanu ridge) consists of mainly limestone. This area, often referred to as "Little Retezat" (Retezatul Mic /Kis-Retyezát/), is rich in karstic formations: steep white walls, gorges, caves and dolinas characterize the scene. Due to erosion by frost-cracking, the terrain is almost exclusively rocky in the higher regions. Take caution when walking on this scree, partly because of unstable ground and partly because trail markations are harder to spot here (more on this in the Routes section). Retezat is home to more than 1100 plant species (including Edelweiss, several species of Gentians, Rhododendron kotschyi, Doronicum carpaticum, Dianthus glacialis, etc. ), at least 62 of them being endemic (Rubus retezaticus, Trifolium retezaticum, Festuca pacyphylla, Hieracium borzae and nigrilacus, just to name a few). Have a look at the Flora and fauna of Retezat Mountains album. These mountains are inhabited by chamois, wolves, lynx, bears, otters and marmots (re-introduced in the seventies), several species of birds of prey, reptiles like salamanders and vipers (Vipera berus and Cerastes cornutus - take care on sun-warmed rocks, especially in Little Retezat). Trouts are common in lakes and creeks. Cows are brought up from the villages to graze in the summer. Have a look at the Flora and fauna of Retezat Mountains album. Retezat Mountains can be easily accessed from north (Haţeg /Hátszeg/ town) and east (Petroşani /Petrozsény/ city), either by train or by car (described in detail below). It is also possible to drive or get a taxi ride up to Poiana Pelegii (campsite by the southern main ridge) from Haţeg town. From these cities you will have to take a car or a train to go further. Using the roads in Romania requires paying a road toll. More information on this can be found here. To North Retezat: National road 66 (European E79) stems out of national road 7 (European E68) just east of Simeria /Piski/. Take this towards Haţeg and Petroşani. At Haţeg, you do not need to go into the town, just pass by, following 66 further to Petroşani. You'll pass through Sântămăria-Orlea /Őraljaboldogfalva/ and Ciopeia /Csopea/ villages and arrive into Ohaba de Sub Piatră /Kőaljaohába/ village (there is no sign that tells you the name of the village). Here make a turn to the right, towards Nucşoara /Nucsóra/ village (there's a road sign where you shall leave the national road). Follow the written signs for NP Retezat (or the blue stripe tourist marks). You'll pass by Sălaşu de Jos /Alsószálláspatak/, Sălaşu de Sus /Felsőszálláspatak/ and Malaiesti /Malajesd/ villages before getting to Nucşoara. After Nucşoara, you'll cross the Nucşoara creek on a bridge, soon after which the road becomes and unpaved rocky road (drive carefully). This road leads to Cabana Cârnic (hut). Further entrance with car is prohibited, but parking possibility is provided here (check the Huts section for more). To South Retezat: For this, you'll have to drive around the mountain range. Take national road 66 (European E79) from Simeria as described in the previous paragraph, but go all the way to Petroşani. From there, continue as described below. To North Retezat: From Petroşani, take national road 66 (European E79) towards Haţeg and Simeria and make a left turn at Ohaba de Sub Piatră village towards Nucşoara. Continue as described in the previous paragraph. To South Retezat: From Petroşani, take national road 66 (European E79) south and make a right turn at Iscroni (just by Petroşani) towards Uricani and Câmpu lui Neag (national road 66A). This road has asphalt cover beyond the Buta gorge tourist center (Complex turistic Cheile Butii), where you can park the car. Accommodation is available here (ideal for climbing in Buta gorge), or by walking further up to Cabana Buta (hut, ideal for exploring the southern main ridge and Little Retezat). I recommend using an online route planner and getting directions to Haţeg or Petroşani from where you intend to approach. The nearest point of access is Ohaba de Sub Piatră, which can be reached from Deva /Déva/ or Petroşani by passenger trains that connect these cities. From Ohaba de Sub Piatră train stop, minivans (or as they are locally called, "maxi-taxi"-s) provide affordable means of getting to Cabana Cârnic, if you wish to skip the rather boring and long first section of ascending to the feet of the forests. A timetable and phone number can be found here. For up-to date information about available trains I recommend using the Deutsche Bahn's website to check the actual situation). Hiking routes in Romania are marked by red, yellow and blue colors, and use three shapes: stripe, dot and triangle. From this point, I will use abbreviations for these (for example: YT=yellow triangle, RD=red dot, BS=blue stripe, and so on...). In general, markings are good, but at some places are not so adequate. For example in rocky regions the yellow signs are hard to catch sight of since they melt with the yellow-greenish lichen cover of the rocks. In such places you can often find "rock dummies" and metal poles as good substitutes (the latter also do good service in grassy meadows). Nevertheless, either red or blue color would be much more visible, and thus appropriate for these routes. The state of the trails is generally good, although the steep sections are often degraded by the strong traffic, with much of the larger stones having been rambled down and, leaving only unstable gravel and dust behind. Take care at these sections. Probably some trail stabilization and conservation work would be good to get done. Trails that bypass peaks are rare. For example, to get to Vf. Păpuşa from lake Bucura, you have to scale Vf. Peleaga first, descend, and then ascend to Vf. Păpuşa. From lake Bucura to Vf. Retezat similarly, through Vf. Bucura. This is not bad at all :) but you shall be aware that in most cases you have to do the same kind of up-and-down journey on the way back as well! Some trails are intended by the National Park Administration to be disused for different reasons. The markings of these trails are no longer maintained (and so are the trails themselves). Such trails are: the RS from Vf. Păpuşa to Vf. Mare (through the exposed Porţile Închise ridge section), the YT leading through Valea Rea valley and the RC connecting it with BS near Cabana Genţiana. This schematic map shows the all major trails (yellow dots) of central Retezat. White dots denote trails whose maintenance is discontinued. Hover the mouse over the dots for peak (red dot) and hut/campsite (white dot) names. Direction of huts/campsites situated in the outer areas of Retezat are shown by the arrows. The boundary of Gemenele Reserve (see Red Tape below) is indicated by white dashed line. Though Retezat is not the climbers' ultimate paradise, places like Colţi Pelegii ("tusks of Peleaga"), the north-east wall of Bucura II and the north face of Vf. Retezat offer good classic climbing routes (ranging from 2A to 5A and 1B-5B, respectively, according to the Romanian system - see below). The ridge section by Vf. 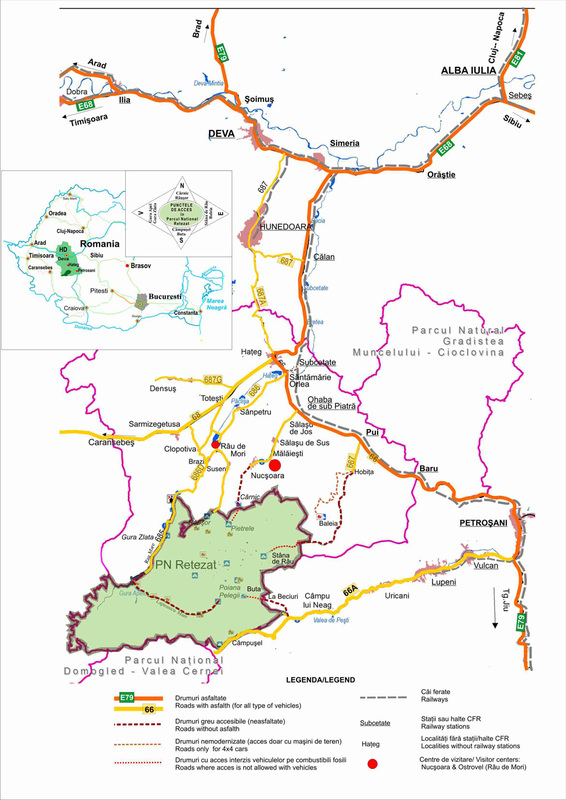 Judele and Poarta Bucurei offers exciting parts as well (2A-4B), but it also forms the border of the strictly protected Gemenele Reserve (see Red Tape below). Further climbing possibilities (sports climbing) can be found on the limestone walls of Little Retezat, for example in the Buta gorge (Cheile Butii, difficulties: 1B-4A). 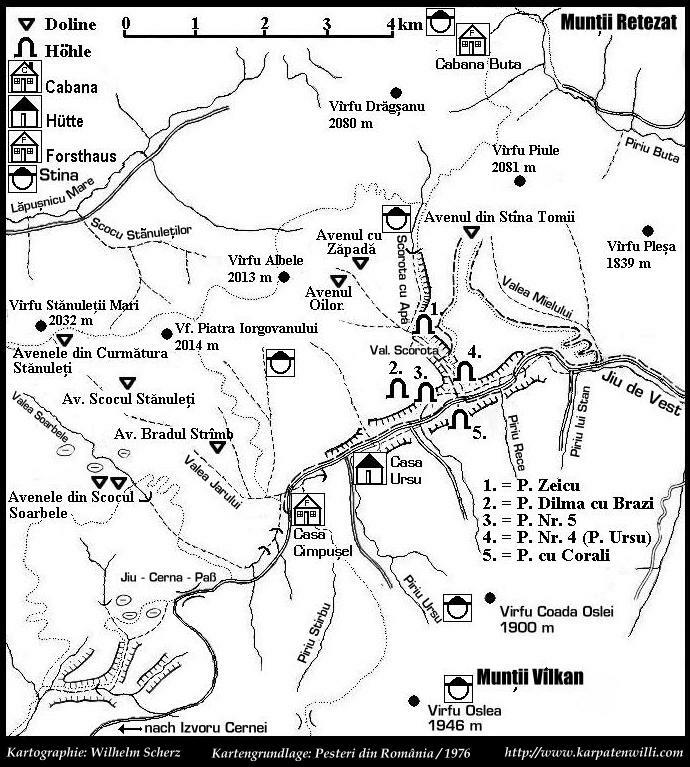 A comprehensive list of the over 70 climbing routes of Retezat (with hand-drawn sketches of Bucura II wall and Colţii Pelegii) is available here (page in Romanian). There is another page dedicated to climbing in Retezat, with topos and description in Romanian here. The Romanian grading system follows the Russian grading system, classifying routes from 1 (easy) to 6 (extremely difficult), with sub-divisions marked by A (easier) and B (harder). This enables 12 grades, ranging from 1A to 6B. However, this system does not illustrate the real technical difficulty of a route. There can be big differences between the routes of the same grade. The first nature reservation area, proposed by botanist Gyula Nyárádi Erasmus, was founded in 1927. Further work of botanist Alexandru Borza and speologist Emil Racoviţă resulted in the establishment of Retezat National Park in 1935 (as Romania's first NP). Its area exceeds 20,000 ha, with buffer zones adding up to more than 38,000 ha. Since 1980, Retezat National Park is a UNESCO Mand and Biosphere Reserve as well. Beginnig from May 2010, a small admission fee (as of 2014, 10 RON per person) shall be paid upon entry into the National Park. The ticket is valid for 7 days, independently of the number of entries within this period. The main NP visitor center is located by the road about halfway between Mălăieşti and Nucşoara villages. There is a strictly protected central zone (1630 ha), called Gemenele Scientific Reserve. Entry to this area is prohibited without written permission of the Romanian Scientific Academy (to be taken seriously)! The reserve is in the western part of the National Park, its boundary (on the east defined by the Vf. Retezat - Vf. Bucura - Poarta Bucurei - Vf. Judele ridge, in the south defined by the main ridge north of Zănoaga Lake) is marked by red square with white outline (a combination not used for hiking trails otherwise). Areas open to the public have some rules, too. It is forbidden to leave trails, camp outside of designated sites, or put up a fire. Swimming is prohibited in Bucura Lake (and the others as well, I suppose). You should bring all your trash back down with you when leaving (just like elsewhere)! Please do a favour for the mountains by fetching garbage that others have left behind. If you plan to climb, it might be advisable to contact the National Park administration (see External Links section below) and/or Salvamont (see Mountain Rescue section below) in advance. Huts (cabana in Romanian) are somewhat asymmetrically located: most of them being concentrated in the in the northwest (Cârnic, Pietrele, Genţiana) and southeast (Buta) region. These are described in more detail below. In the southwest and northeast former huts (Rotunda and Baleia, respectively) were shut down about a decade ago, however they are reported to be reopened in recent years (Rotunda was reported to be closed again in 2012). In addition, there are three touristic complexes with higher level of services available (Complex alpin Râuşor, Complex turistic Cheile Butii and Complex turistic Dorulet), plus a number of scattered pensions as well. This rural pension/hut in the Nucşoara Valley (northern entrance to Retezat National Park, BS) is run by a kind couple who live there with their two children. The house can accomodate 29 persons for 25-40 RON/night/person, depending on the room type. Tap water, food and electricity are available. There is also camping (7 RON/night/person) and safe parking possibility (this is the farthest point that you are allowed to drive up, coming from the North). Parking costs 5 RON/night. In high season (summer, but especially August) it is advised to book in advance. Located in the Stânişoara Valley (BS from Nucşoara, BC from Complex Alpin Râusor). The main hut, which once was able to accommodate up to 150 people, has burned to the fundaments in February, 2007. The remaining scattered bungalows are available and can accommodate up to 102 people in summer and 42 in winter, for 30-35 RON/night/person. It's recommended to book in advance. There is possibility to camp as well, however the designated camping area gets easily overcrowded. In the Pietrele Valley, between Bucura Lake and Cabana Pietrele (BS from both, but if you're coming from Nucşoara, you can make a shortcut - omitting Cabana Pietrele - by BT). More peaceful than the hut complex of Pietrele. This shelter is owned by the tourist club Montan Club Floarea Reginei. It provides accomodation for 40 people, and is open year-around. A special tea can be bought, as well as beer and chocolate, but normal food you must take and cook yourself using your own stove. There are beds in the heated basement for 18 people, the rest of the places is on the unheated upper level. The price of accommodation is 30 RON or 25 RON per person per night (basement or upper level, respectively). Pre-scheduling with the maintainers is required, although language barrier may exist. You can read a detailed review about this hut on the www.mountainhuts.info website. In the upper part of Buta valley (BS / RC either from Bucura Lake, via Poiana Pelegii, or Complex turistic Cheile Butii). Rebuilt in 2000, after the old hut burned down. The hut offers accommodation for about 40 people (4 rooms in the main building, plus two detached bungalows) and also a buffet. Located by the Buta Gorge, in the southeast. Accessible by car from Petroşani on asphalted road. Accommodation with 130 beds, grid-connection, warm water, good reastaurant and sports field. Concerning all the comfort, this place could rather be classified as a mountain hotel. A group of cottage houses on the west side of Culmea Lolaia /Lolája-gerinc/, accessible by car from Suseni /Szuszény/ (road got asphalt cover all the way up in 2006). Reported to have motel with 120 beds, grid-connection, warm water and reastaurant as well. There are signed trails towards Retezat peak and Pietrele hut, but the main attraction of this place is skiing. The ski-run (established about a decade ago) is 1200 m long, with 330 m elevation difference, its maximal slope is 38°. The most centrally located, and thus most popular camping place on the southern shore of the lake.Many trails meet here: BS from Cabana Pietrele, RD from Zănoaga Lake, YD from Lăpuşnicu Mare, RC / BS combo from Cabana Buta and Poiana Pelegii, and YC from Vf. Peleaga (from Stâna din Râu direction). Its popularity is not without a reason: most of the "priority sights" are within the reach of a dayhike. This is a windy place! Several stone fences are built on the site for wind protection - it is advisable to place your tent into one of them. On the east side of the lake you can find the Bucura refuge (2050 m). 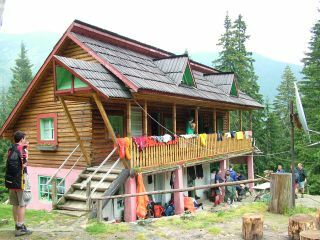 This is the station of the Romanian Mountain Rescue (Salvamont). If you get into trouble (for example, wind breaks your tent into pieces) this place serves as emergency shelter: they will put you up for one night, but then you'll have to leave. This campsite is located along the most popular access trail (BS coming from Nucşoara), at probably what was the most popular hut - at least in the north region - (see huts below), so it can easily get overcrowded with tents almost touching each other, forcing those who arrive late to set up theirs outside the designated area, in the woods (as it happened with us). Anyhow, if you can't start early enough to get up to Bucura Lake in time, this is the only place you can camp legally. The site is below the treeline, so wind is not as much of a problem as it is in higher elevations. Food shall be handled keeping in mind the bears, however (not that if they would especially like crowded - and thus noisy - places, but just for safety). Water (potable) is available from an outlet by the bridge that crosses Stânişoarei creek (NOT from the creek itself). Just continue on the marked trail from the campsite towards the remains of the former main hut to get to the bridge (you'll pass a couple of wooden houses on the way). Peaks accessible by dayhikes: Vf. Retezat, Vf. Bucura and Vf. Peleaga, Vf. Păpuşa, Vf. Mare. Lakes accessible by marked trails: L. Stânişoara, L. Pietrele, L. Bucura, Lakes of Valea Rea, Tăul dintre Brazi, L. Galeş. Located in the west region, just south below the northern main ridge (which forms the border of Gemenele Reserve here). The nearest high peaks are Vf. Judele and Vf. Bucura (with the wild Poarta Bucurei ridge section between them) but Vf. Retezat and Vf. Peleaga can also be reached by dayhikes. Several of the lakes can be seen from the trails around the area. This place can be accessed from the valley of Lăpuşnicu Mare /Nagy-Lepusnyik/ creek (where you can get to by taxi from Haţeg, then follow YD and take BC / RT) or by foot from Bucura Lake taking the RD (might be considered as an option if the campsite over there is overcrowded and you want some peace - however, this way you're giving up on dayhikes to the eastern region). Located in the south zone, by the Buta creek (next to the recently rebuilt Buta hut). This campsite seems to be the best for discovering Little Retezat and also suitable for dayhikes to the rest of the southern main ridge (i.e. Vf. Custura, but probably Vf. Păpuşa as well on the northern main ridge). It can be accessed by following the BS / RC combination that connects Complex turistic Cheile Butii with Bucura lake, via Poiana Pelegii. Unfortunately I have no personal experience from this place. In the east region, near to a sheperd shelter next to Râu Bărbat /Borbátvíz/ creek. Can be accessed from Poiana Baleia (also a designated camping place, by the Baleia hut, assumed to be accessible by car from Hobiţa /Hobica/ village) by following the BT signs that ascend the southern main ridge from the east (for a while it goes along with RT signs but after Şaua Gorova /Gorova-nyereg/ the two signs depart from each other - you can also put up a tent legally at this point). I have only seen this site from the north ridge, it looked to be a peaceful one. Nearby peaks: Vf. Custura, Vf. Păpuşa, Vf. Mare (Vf. Peleaga could be reached, too). Other sights possible to see from the distance (most of them only get visible once you've got up to either the northern or the southern main ridge): Cascada Ciomfu (waterfall), Custura Lakes, Tău Ţapului, L. Peleaga, Lakes of Valea Rea, L. Adânc, L. Galeş, Porţile Închise ridge. Located between Lake Bucura and Cabana Buta (closer to the latter one), by the Peleaga /Felső-Lepusnyik/ creek (not far from Lăpuşnicu Mare waterfall). Accessible from these two on the trail marked with BS / RC, or by taxi from Haţeg. Since it is about halfway to both the central part of the north main ridge (Bucura valley and its peaks and lakes) and Little Retezat to the south, it can be a good starting point if you want to visit both areas from one place. I haven't been to this place yet, though. While most pictures here show the sunny face of Retezat, this range is (in)famous of rain and wind. The amount of rainfall varies with elevation: at the foot of the mountains it's around 900 mm/year, but surpasses 1300 mm/year at medium height (1600-1800m). At higher elevations, the yearly amount of precipitation decreases. However, the number of days with precipitations is 175-180 out of 365 above the treeline. The most rainy month is June (with the heaviest rainfalls), the most dry is October. At higher elevations you can expect snowfall even in summer. Annual average temperature is 6°C at the feet of the mountains and -2°C in the peak area. The coldest month is January, with average temperatures below -10°C in the peak area. On the ridges and peaks, the number of days with frost is around 260 per year, thus it usually takes a while for the winter snow to melt. In winter and late fall, thermal inversion can happen: the higher region gets warmer than the foggy valleys underneath (where temperatures below -30°C have been recorded). Nevertheless, fog is not restricted to the valleys: peaks can be cloud-covered for days. The warmest month is July, with 16/6°C average temperatures in the lower/upper region. Wind blows almost all the time on ridges and peaks, at the time of storms it can reach 100 km/h. The most windy month is February, the least windy is August. The stickers below provide weather data for three villages at the feet of the mountains (north: Nucşoara and Hobiţa - southeast: Câmpu lui Neag). These are good to get a general feeling of what's around, but bear in mind that in the high regions the situation may be quite different. For the latter, you may estimate the weather using the meteoblue service. Online weather situation for the city of Petroşani and another nearby meteo station, Cuntu is also provided by the Romanian National Meteorological Administration. All Romanian online stations can be accessed here. It is possible to visit Retezat any time of the year, but the best conditions can be anticipated around late summer or the beginning of fall, when temperatures are still warm, yet rain is relatively scarce and winds are not so strong (on average). Be prepared that weekend traffic is usually large compared to other days. Cabana Pietrele and the Bucura Lake campsite may get crowded. In winter, Salvamont station at Bucura Lake is left unattended, but it is possible to bivouac there. Good judgement is essential if you are heading to the central, high zone in snow, because the place is deserted then. Avalanches are most frequent in late winter and in springtime. Steep slopes, for example the upper parts of Stânişoara, Pietrele, Galeş Bucura and Buta valleys can be dangerous. Salvamont has a permanent bases at Pietrele and Râuşor. Semi-permanent bases are located at Bucura lake, Poiana Pelegii and Zănoaga lake, where rescue teams are stationed in the summer period (usually from 15/June till 15/September). In the winter season there is no personnel in these refuges, so they can be used freely. Recently, Salvamont established three additional refuges, which are unmanned but available for hikers throughout the whole year. 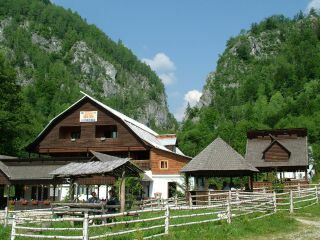 These are located at Buta campsite, Stâna din Râu campsite and Baleia campsite. Munţii Retezat/Retyezát-hegység/Retezat Mountains (1:50,000) by Dimap, with guiding text on the backside in English, Romanian and Hungarian. Can be ordered online from Dimap here. Munţii Retezat/The Retezat Mountains/Das Retezat Gebirge (1:50,000) by Bel Alpin, with text in English, German and Romanian. I saw it for sale at Cabana Cârnic (in Aug, 2012) and online here. Judele peak is a little north from where the maps indicate it. Not to worry about too much, as the trail leads you the right way. Be aware that the last portion of this trail (in the side of Judele) can be dangerous when wet. There is a path (not indicated on the maps) leading from Judele pass to the summit of Judele peak. First it follows the ridge, then ascends the peak on its W side. People often visit the peak following this path. If you decide to follow their example, pay attention: the second part is exposed with high walls below. Porţile Închise is traversed by the trail marked with RS coming from Vf. Papuşa (not indicated fully on the map). I assume the trail continues further towards Vf. Mare (had no time to check it out all the way, because of need to turn back). At Zănoaga lake, there is a recently renovated little wooden house by the shore, functioning as a Salvamont base. The building is not indicated on the map by Dimap. See also the raster map of the broader region at the Retezat tourism association website. "It happened in those old times when multiple-headed, fire-breathing dragons were the lords of the rocks, that Iorgovan, a strong young man was in love with a beautiful shepherd girl. One day, the girl didn't come back from the mountains. Iorgovan went to look for her, but his long and desperate search was in vain. Traumatized by the loss, he decided not to return to his home in Wallachia, but to live in seclusion, at the rock which is named after him today. Iorgovan had been living like that for a while, when one day a beautiful female voice echoed from afar. He immediately recognized the voice of his true love, who had been kidnapped by a dragon. Iorgovan knew that in his homeland people thought he was long dead, so he headed to the north side of the mountains, to Transylvania, where he acquired a huge, 40-centner maul. When the dragon was basking in the sun on a nearby rock, Iorgovan mounted a horse and leapt from behind another rock, turning on the dragon. The dragon was stronger though. Iorgovan survived but he was very upset about the defeat. So, he went down to Transylvania again, and this time he got an even bigger, 99-centner maul. With this weapon he fought the dragon once again, and finally won after a prolonged battle. The dragon breathed fire in his anger, turning all the trees and bushes in his way to ash. Iorgovan chased him all the way as far as the border. There the dragon turned to him and said: "Well, Iorgovan, until now I was the lord of the mountains and all the animals who live there... from now on, you will be reigning there, but I'll send deadly flies to take a revenge on you and your herds." The dragon left for the mountains of Mehadia, and bled to death in one of his caves. His fire heated up the springs so much that flies were roused. They have kept coming to relentlessly pester the poor cattle in the mountains ever since. And on the top of Iorgovan’s Rock, an imprint of a horseshoe, surely left by Iorgovan's horse, can still be seen..."
Important dinosaur fossils (perhaps the great-grandfathers of Iorgovan's dragon?...) were found at Sânpetru /Szentpéterfalva/ (just north from Retezat, in the Haţeg basin) in the end of the 19th century. The fossils (most important ones: Telmatosaurus transsylvanicus, Rhabdodon priscus, Magyarosaurus dacus and Struthiosaurus transsylvanicus) age back to 65-68 million years (late Cretaceous period). The most preserved fortress ruins of the area can be found by Suseni /Szuszény/ village, in a breathtaking setting: on top of a steep rock formation, on the right side of Râuşor creek. First mentioned in 1493 (only a tower stood then), the fortress was still inhabited in 1670. Today's 7-8 m high walls were more than 10 m high in the past. It is not easy to find the way up (old markations are missing due to clearcut forest), but the ruins offer great view to Haţeg basin. Retyezát honlap - informational website dedicated to Retezat. Salut! There is a problem with the link you gave. The url does not change when one changes location, so when someone clicks on it, they will either see the last location they saw earlier, either Bern (Switzerland), which is a default, I guess. To see what I mean, try to visit the link after having cleared the cache of your browser. On the site I searched for 'Bucura'. The one I suppose you recommended, is 'Bucura, Hunedoara' - but it tells 413m a.s.l. and the coordinates also point to Cugir, so I think it's not Bucura lake. However, if you search for 'retezat', there's an entry with 2334 m a.s.l. - this could be the correct one. The problem with the url still has to be solved, though, I'll look into it. Any further suggestions to improve the quality of the page from your point of view? Found the way around surprisingly fast: http://www.meteoblue.com/index.php?id=246&L=&did=135&zf_f=28193&zf_c=ro You might want to change the link on your Vf. Retezat page as well to this one instead of that Bucura. You're right. Thanks for the hint. I corrected and used this link instead: http://meteoblue.com/index.php?id=246&L=&did=135&zf_f=5282&zf_c=ro. You get the same result by writing "lacul bucura" in meteoblue text field (country - Romania, "Towns only" option unchecked). But I suppose both options are equally good. Now regarding main Retezat page and the 3 child peaks, I think you've done a very good job. Structured, detailed and updated information. Maybe some remarks regarding the climbing chapters. The problem with climbing in Retezat is that information is missing about routes and their grade. The classic Romanian/Russian grade notation 1A - 6B is old fashioned and incomplete. This grade does not illustrate the technical difficulty of a route. For example one 3B route may have maximum difficulty UIAA 5 and another 3B route might be UIAA 8. There's a big difference between them. Anyway, some routes in Retezat have also the UIAA grade next to the classic one, and I hope things will start to move on. But for the moment somebody needs to start gather and structure this information. So, for the moment, I think nothing is to be done regarding this. There is a page dedicated to climbing in Retezat (topos, description in Romanian): here. You can add this link in main 'climbing' section if you consider appropriate. This Lacul Bucura option seems good indeed. About the climbing grades, yes I am aware of the drawbacks of the old system. Thanks for the link, it is far better than anything I've found, so it will surely be included. By the way, I see you're familiar with the area, plus live closer, plus speak Romanian - so if you'd like to have editing rights for the page, tell me. Four hands can do better than two, and I see you did a good job with the Retezat peak page. Thanks for the credit Peter, I don't see right now what else could be added on the page, the content is very good. Maybe in the future, when new information will be available, we can update the climbing section for these mountains. Cheers. All right, just tell me when there's new information to add. Cheers. the minivan schedule to/from ohaba posted on this page no longer seems to apply. the one given on http://retezat.ro/index.php/romana/pentru-oaspetii-pnr/53-transport/74-transport-retezat-carnic-ohaba.html is reproduced on posters locally. but when i was at carnic 27-31 august 2012 no minivans were seen on this route at all. local people at salasu de sus told me they do not run every day. i suggest you do not rely on this transport. Thanks for the note, I've updated the info on the page.